Diwali is right around the corner and in most of the homes,the preparations must have started too.The zeal,the lighting and the ambience creates a unique feel in this festive season.The halwaiis,sweet shops,fire work shops,gift shops,apparel stores may be having good business during this time in India..Though we don't celebrate Diwali but love admiring the festive feel of Diwali.I miss the Diwali's that we had at many places in North India as kids.I was always scared of pataka(fire crackers) but the lighter ones like chakra crackers,flower pots ones were the most liked ones.Every year dad ensured to buy the chakra and flower pot crackers just to keep us happy and didn't make us feel odd one out in the community.And dad's friends,my school friends always visited us with packs of sweets or homemade sweets.We(me and my sis) used to choose the best ones as soon as they leave and finish them off,he he.The other sweets lesser in demand were often left out in refrigerator for days and were the last ones to get over.Diwali time invariably was a big pile of sweet boxes in the refrigerator.Winding through the memories of Diwali,I do miss all those days now esp the delicious sweets. Mawa gujjiya was one of the sweets among the gifted ones from my friends especially during Holi time.I am not a sweet tooth and so gujjiya,burfis were my childhood favorites unlike gulab jamun,rasagullas,jalebis that dripped sugar.My love for gujjiyas made my mom try these from homemade mawa and we loved it very much.But now,when I asked her the recipe she remembers the ingredients but the actual measures were forgotten.Then,I looked online for the filling measures and found one which almost fitted to the same like mom made.I never got a chance to have these again in these many years(esp after marriage).When I made the home made mawa at home,I thought to give these a try.And that was a good decision,all loved it especially my little who has a big sweet tooth has demanded to make it again soon.Mawa gujjiyas are sweet pies filled with reduced milk(mawa),sugar,dry fruits,nuts and semolina.The filling itself makes me drool,loved every bit of it.Mawa gujjiyas are also known as'chandrakala' in some places like Bangalore and these fried gujjiyas are dipped in a sugar syrup and garnished with sliced almonds and served as chandrakala.Though Gujjiyas are popular during Holi but I thought Diwali may also be a good option to post.I used a mix of wheat and all purpose flour(maida) but originally only maida is used.Also there are many variations in the filling for gujjiyas too.Some make the coconut stuffed gujjiya thats already in my space,some do the mawa filling alone and I did a mix of both as I remember this taste most.Do try if you like gujjiyas and enjoy !! Chop the nuts and dry fruits in small pieces,keep aside. Dry roast the sooji/rava in a pan on medium flame by stirring for 2-3 mins.Keep aside in a plate. 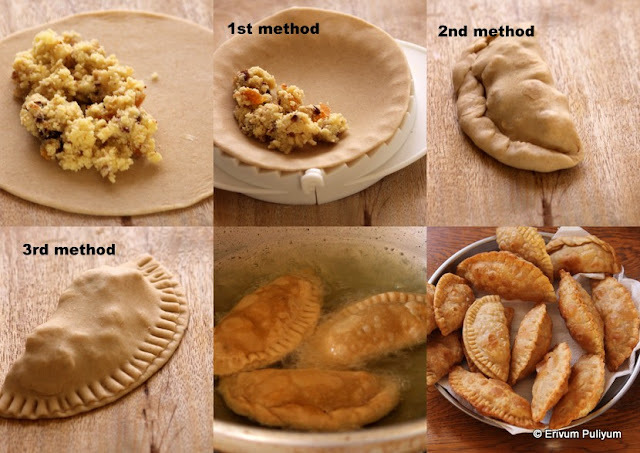 In a bowl,add the all purpose flour(maida),wheat flour,salt ,ghee and mix well.Add in water and make a stiff dough like we do in chapathi dough.Leave aside covered for 20 mins and in the mean time make the filling. Heat ghee in a pan and add the crumbled mawa on low heat.Keep stirring and add in powdered sugar.The mawa starts to melt down and combines well with the sugar.If you plan to leave out semolina or sooji then dry up the mawa mixture else leave moisture slightly and switch off flame. 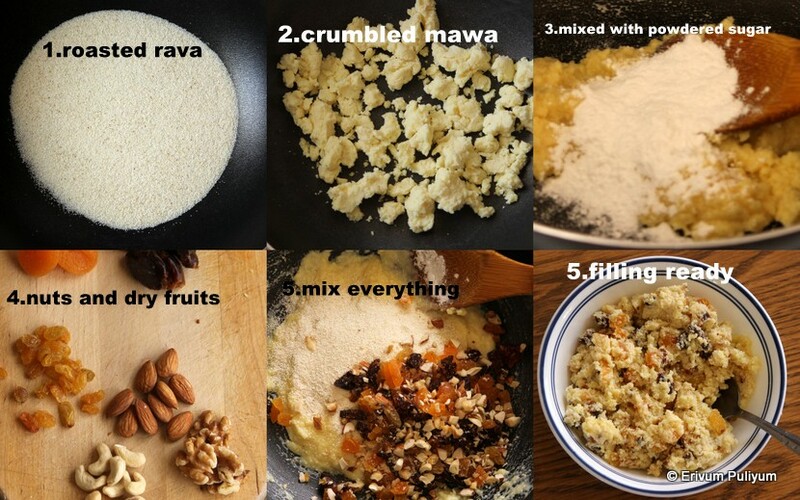 Add the cardamom powder,semolina,dry fruits and nuts.Give a quick mix to combine,leave to cool(The filling may turn hard slightly as semolina absorbs moisture but not to worry as they are fried the filling returns back to moist and delicious). 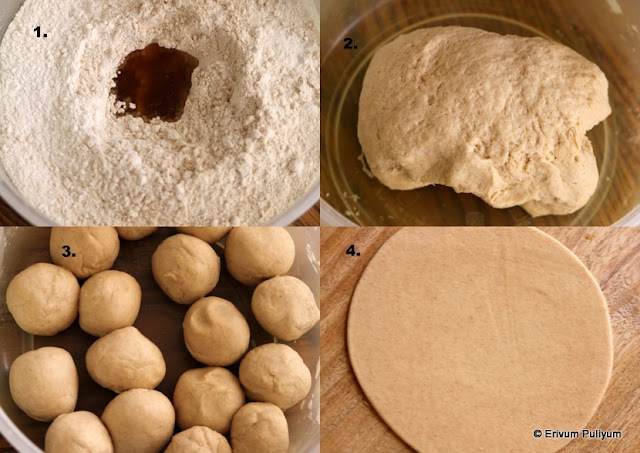 After 20 mins,make equal sized 15-16 balls.Keep covered.Dust the rolling surface with flour and using a rolling pin,roll out the ball in a disc of 3" diameter(don't make discs very thin).Add a tbsp of prepared filling in the center and cover the ends to form semi circle.If it doesn't stick together,add a drop of water to wet the sides and then stick.Using a fork,press the sides or crimp the edges to form a decoration.I had a hand pie mould and so made in that and some with forks.Crimping the edges gives a neat clean look but the edges take longer time to cook though(see pics for better understanding). Place the prepared one on a plate and keep covered else it may dry up.After making 5-6 of them,heat up oil in a wok/kadai and keep on medium flame.Start sliding the prepared gujjiyas in,once the oil is hot.Flip and turn the gujjiyas to evenly brown all sides,drain with a slotted spoon to layers of paper towel(I fried a batch more browner than the first batch,browning totally depends on how you like it).Repeat the same step until you finish preparing all the gujjiyas. Fry all the gujjiyas,drain on paper towels and serve or store in air tight containers. * Don't use icing sugar for powdered sugar as it has corn starch.I powdered the granulated sugar in the blender jar. * You can use your desired dry fruits nad nuts or as per availability. * Adding sooji /semolina is optional.Adding gives a nice texture to the filling and increases the filling quantity slightly. * The sealing of the gujjiyas is very important and make sure the filling doesn't creep out.Use a drop of water on the edges to ensure proper sealing. * Don't overfill the gujjiyas else it may break open when frying. *The dough shouldn't be rolled out very thin and also make sure to get the sides thinner than the inner circle else the sides may take longer to cook. * If you plan to make large batches and store for days,then its better to use all purpose flour alone as it tends to be crispy longer but if you wish to make a small batch as I did then adding wheat flour is fine. * If you want to dip these in sugar syrup after frying like we do for chandrakala,then boil a cup of sugar with 1/4 cup water in a pan and wait till it reaches one string consistency.Drop the fried gujjiyas in sugar syrup directly like we do for badusha.And then garnish with sliced almonds. 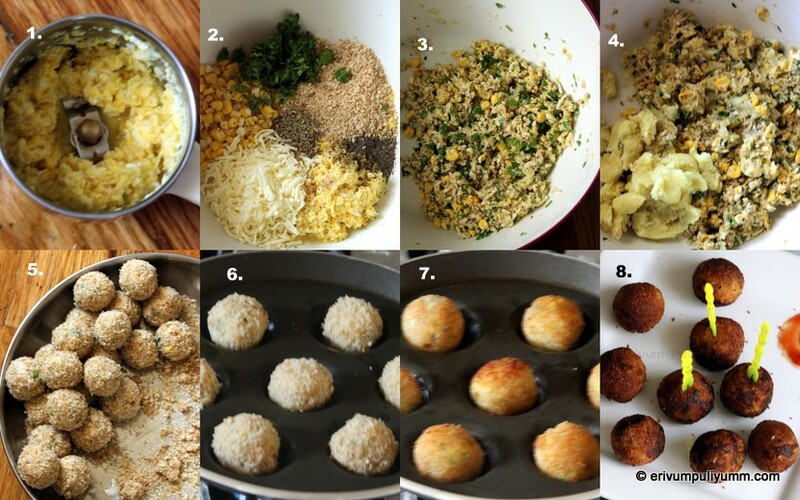 * The filling recipe is adapted from here. Mawa is used in making many sweets like burfi,gulab jamun,carrot halwa,peda,gujjiya,kalakand and many others.Mawa(Khoya) from scratch is not an easy task as it requires time and a good arm exercise.Also,the end result is very less; no wonder the price of sweets from sweet shops is always on the higher side.Paying high is not a big deal for an original sweet but these days most sweet shops have short cuts and adulterated means especially during festive seasons when the demand is high by which they don't deliver the original tastes and flavors(which we once enjoyed as kids).Few months back,I saw a video that showed people in north India making ten liters of milk from just half a liter of original milk.The best part of these kind of milk is that lactometer also shows it as grade one milk,that means its hard to distinguish the original versus duplicate.Can you imagine how they make the milk? ?I was so shocked to see that and that's what is packed in packets.They make the milk using shampoos,oil ,detergents and so on.These practices go up especially during festive times when the demand is too high.Sad is the affair there,hope things take better turns and our kids get healthy food may that be vegetables,fruits,animal meat or diary products. Coming back to the post,this recipe is a keeper and all it needs is an extra time and just one ingredient-whole milk.Mawa(Khoya) had been in my make list since very long and I wished to try the traditional way of making from whole milk(scratch).These days there are many short cuts to make mawa.You can use evaporated milk or milk powder or add condensed milk to milk powder or with heavy cream and so on.However,I definitely wanted to try the recipe from scratch just to know the correct texture and taste so that I could co relate this knowledge next time if I try out with any of the short cut methods.Stay tuned for the recipe coming up with homemade mawa ! Bring the milk to a boil on low heat in a heavy bottomed pan (I used my non stick pan) so that the milk doesn't burn and stick to the bottom of the pan. 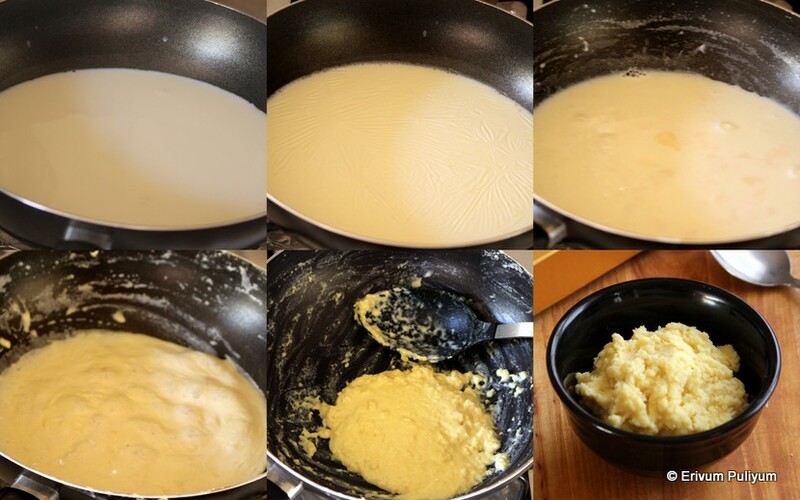 Once the milk is boiled,keep stirring the milk every two -three mins scraping all sides and bottom so that the milk doesn't get burnt at the bottom of the pan. Scrape the bottom and sides and constant stirring in the last few mins so that milk is thickened.When you see a slight moisture left out and the mawa comes together,you can put off the flame(it thickens on cooling to remove the last moisture left out). On cooling,refrigerate the mawa or prepare your favorite burfi,peda,carrot halwa,gujjiya or laddus with fresh homemade mawa.The color was creamish in color,mild natural sweetness when reduced from milky white and gives a cup(200gms) of mawa for 1 liter of milk. * I have adapted the recipe from here. * I have used organic whole milk but you can use as available.Use only full fat milk else the mawa may not be good and much lesser from fat free and reduced fat milk. * You can add condensed milk to the mawa to get sweetened mawa.The granular form mawa can be sued to make laddus and kalakand(check out avocado kalakand made from paneer). * If your mawa has some moisture left out,that's the way its used for making gulab jamun and carrot halwa. * If the mawa is thick and can be shaped like a dough,you can use for making burfi,laddus and gujjiya(check out gujjiya with coconut stuffing without mawa). Spinach(Palak) is a versatile veggie that can be used as chopped,pureed or raw.However,let me confess that I was the last one to have the pureed version of spinach as a kid and as well as a grown up(esp as a hostler).In our mess invariably when palak saag was made,I would definitely skip meal or atleast this curry.They prepared the curry in an entirely different way too which didn't tickle my taste buds and that must be another good reason for hating the spinach puree.But as time passed,my tastes changed considerably or I became matured enough to understood the concept of adding greens to meals.I started experimenting with the pureed gravy and to name a few like palak paneer, aloo palak, palak chicken (don't forget to check out in case you missed) of the similar kind in the past which were a hit at home.Now,kids love the oureed version too and this curry is yet another kids friendly recipe as the corn(makai) adds a mild sweet flavor along with spinach puree,yogurt and spices.It serves perfect to serve with chapathis and hardly has any elaborate cooking,makes a quick fix curry for rotis.Try it out and enjoy !!! Wash and chop the spinach leaves.Heat water in a pan and add the water to the spinach to blanch them.Immediately drain water and add to blender.Blend to a smooth paste in a blender. Heat oil in a pan and add the ginger garlic paste/finely chopped.Saute until raw smell disappears. Add in chopped onion and saute.Saute until translucent.Then add the spice powders on low flame,saute and then add the thawed corn kernels.Saute the corn kernels until slightly cooked. Add the spinach puree and cook for a minute.Add in salt and beaten yogurt,mix well.Switch off flame. * You may have to cook fresh corn kernels slightly longer than the thawed kernels. * Don't cover the pan after you add spinach puree else you lose the bright green color.Also,don't cook the puree for long. Garlic (velluthulli) is an age old medicine which now has scientific reasons.They are wonderful seasoning that adds taste,aroma and nutrition to food.Garlic helps improve iron metabolism in the body.Garlic contains a compound called 'allicin' that imparts the strong smell and is beneficial to improve immunity (helps fight against flu and common cold) and cardiovascular health.They helps to expand the blood vessels and thereby keep blood pressure in check and reduces cholesterol levels.Garlic is incredibly nutritious,low in calories and rich in viatmin Cand manganese.They also contain antioxidants that are proven to prevent Alzheimer's disease and dementia.Allicin the sulfur compound in garlic helps to fight heavy metal toxicity like lead.There are even reports that it increases estrogen levels in females but not scientifically proved yet.he good .However,I admit that making pickle out of garlic may not be healthy and beneficial but still may do some good.This a true blend of spice,sour and a mild sweet tinge pickle.The making is real simple.Don't forget to try it out and lemme know how it turned out !! 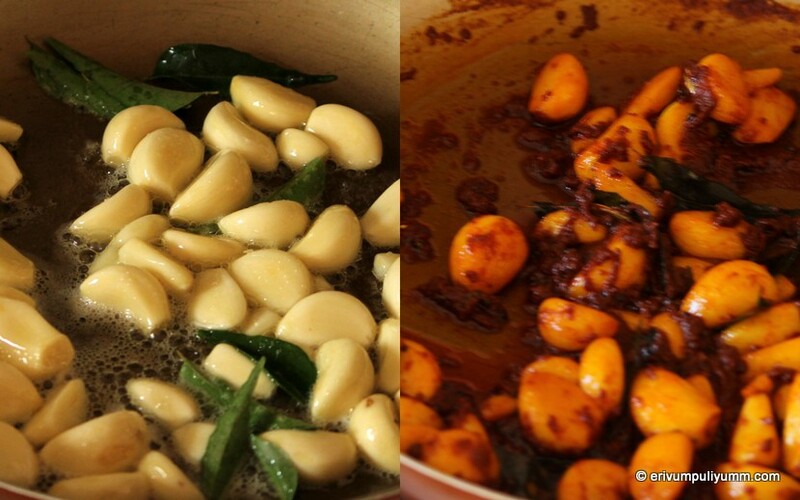 Peel the skin of the garlic and wash the cloves.Wipe them dry on paper towel and keep ready. Heat a pan with gingelly oil.Splutter mustard seeds when hot.add in the sprig of curry leaves. Add the garlic cloves and saute for 3-4 mins continously till it starts to softens.Reduce the flame on low and add in chilly powder,fenugreek powder,turmeric powder,asafoetida and salt. Switch off flame and add the vinegar/lemon juice.Finally add in grated jaggery and give a quick mix. Cool and preserve in ait tight containers.You can start using the pickle immediately but I personally love the flavors after 4-5 days. Enjoy with your favorite Indian staples/parathas. * I have added lemon juice as we love the flavors better.If you tend to preserve longer,then use vinegar to increase shelf life. * If you are using the Indian type of garlic then increase pods.This is the large size garlic cloves that we get here. 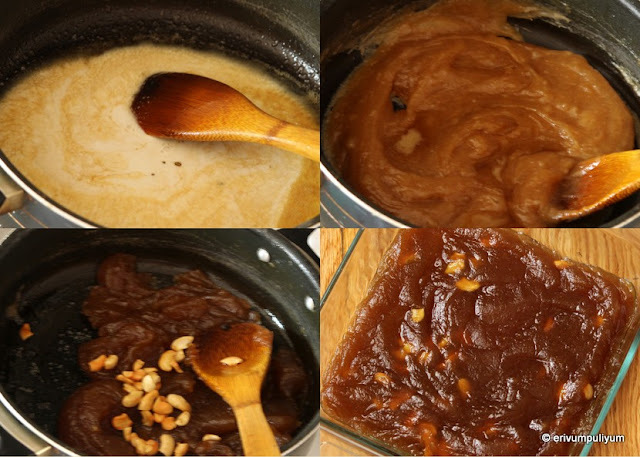 * Adding jaggery is optional,it adds a nice flavor though. Wishing all a Happy Dusshera too !! Quiche(pronounced K-E-E-S-H) is an open pie or savory pie filled with a custard,meat,sea food or veggie filling.Its a French dish served as a party food and can be served hot or cold though I love it warm.This takes up a lot of calories as butter,cream,eggs and the filling if its meat/chicken makes is used.Each time I planned to try quiche was postponed because of the same reason of calories.However,Baking partners challenge for this month suggested by Swathi@ Zesty South Indian Kitchen and Arthy @ Cook with Arthy Sharma was a quiche.And finally gave it a try by trying the mushroom quiche with Indian spices.The pie crrust is first blind baked and then baked with the veggie or meat filling and topped with custard and cheese.You can always alter the spices in the filling and add according to your taste buds.The fillings are versatile and can be made as per preferences.I have followed the recipe suggested except that I added half of wheat flour and all purpose flour(maida) to the crust which worked fine.This serves good for an appetizer and can be cut in eight pieces.If you love the savory pies,am sure you will love this too.The buttery flaky crust with the creamy delicious filling makes it scrumptious.Try this out !! In a bowl,add the flours,salt and cut the butter in cubes.Rub through the flour to get dispersed well.The dough may look crumpy,add in the chilled water.Each clump should hold shape when pressed and not fall together.Cling wrap the dough and refrigerate for two hours -overnight(I refrigerated for two hours). In the mean time,when the quiche dough is resting for chilling in refrigerator,you can prepare the filling.I used mushroom filling.Heat butter or oil in a pan (I used oil) and add in the sliced shallots,sliced onion bulbs and followed by chopped ginger and garlic.To this add all the spice powders listed in filling and saute on low flame.Add the mushrooms and cook till it starts to leave the water.Cook until the moisture is dry and then finally add green onions.The moisture should be completely dried up else it becomes soggy. Thaw the quiche dough for 15-20 minutes after refrigeration so that you can roll it down easily.Now,take two parchment papers of large size or baking mats and keep the dough in between sandwiched to roll them in thin circle of 10-10.5" diameter to cover a 9" pie pan. Pull the top parchment paper and gently transfer the rolled out dough on to the pie pan by inverting so that the parchment sheet is on top now..Pull the parchment paper and now gently remove any excess dough on the sides of the pie pan and shape the sides by gently tapping with fingers on all sides and round with your fingers.If you have any scarps left out,use for any areas were the dough looks thinned out or torn.Using a fork,prick the dough at the bottom of the pan so that it doesn't puff up. 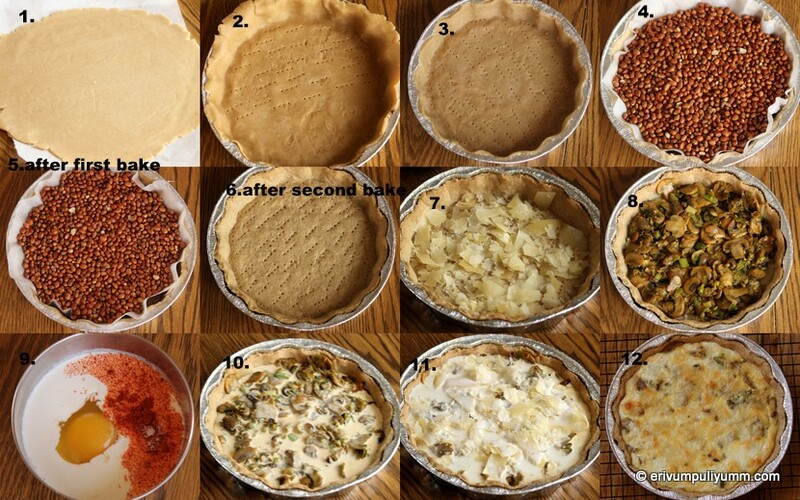 Refrigerate the pie pan for another 15-20 minutes and then pre heat oven to 200 degrees C or 400 degrees F.Add a sheet of parchment paper covering the center of the dough and the sides(for blind baking).Fill the pie pan with legumes or cereals or rice,I used vanpayaru or red oriental beans,but you can use any other cereal or legumes(helps to weigh down the dough so that it doesn't puff up).The beans or legumes used for blind baking may not be fit for cooking as it is exposed to high temperatures then,so use accordingly.Blind bake the pie for 20 minutes and then remove the beans along with parchment paper.Bake again for 15 minutes.Remove and keep aside when you see the sides getting browned and the sides starts to leave the pan. To make Custard- Whip the cream,egg and spices together with some salt nicely.Keep aside. To assemble-Pre heat oven to 350 degrees F and spread the quiche crust with half of the parmesan cheese or cheddar cheese.Then add in the mushroom filling.Fill the custard and top it up again with remaining parmesan cheese.Bake in pre heated oven for 35 minutes or until the filling is set and firm.Serve warm or cold once out of the oven(I cut the slices when it was hot and so the filling was goeey,wait till its warm on touch to cut in slices). * You can add milk instead of cream if you would like to reduce calories.But that may take longer time to set. * The ratio of cream/milk to eggs is 2:1.So,add accordingly. * I used a 9" pie pan but this can be done in a 8" pie pan too. * This is an Indianized version of the filling but you can always alter as per taste preferences. * I have used a mix of all purpose flour(maida) and wheat flour but you can always use all purpose flour alone.In that case just use 1.5tbsp of chilled water. The stores around you may sell breads,buns at a very economical rate than trying to make it at home.But have you ever wondered what goes in the list of ingredients to make a loaf or bread or rolls of bun,the list is pretty long and you may be perplexed to understand them all.But do we really long list of need this long list of ingredients to make a loaf or bun.Not really...my first trial of whole wheat bread was sometime back which built a confidence and believe me that bread was super pillow soft which can be challenged with the store brought bread.I made the bread using the tangzhong method and that really worked wonders.These buns were then added to my do list which finally got some sunshine now.I tried using the tangzhong method ton make these soft buns with wheat flour.They turned out super soft and delicious.All loved the rolls and we had with black bean burger(which I had posted sometime back).If you get this correct,am sure you will never go back to the store brought buns.Enjoy !!! Add the milk,egg(reserve the half egg white to brush on top) and the tangzhong(refer notes to learn about making of tangzhong and the pics in making tangzhong can be seen here). 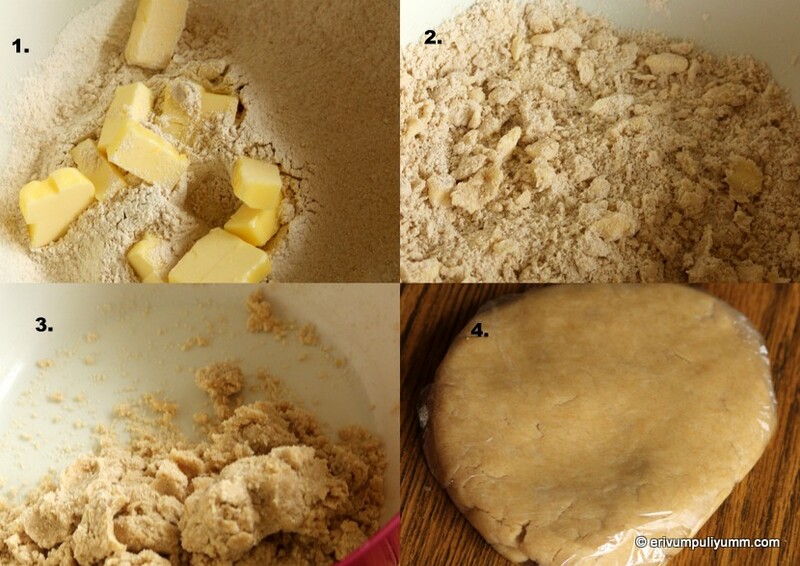 Mix until the ingredients come together, and then knead until it forms dough. Add the butter and continue to knead and medium/high speed until the dough becomes smooth and elastic and no longer sticky. 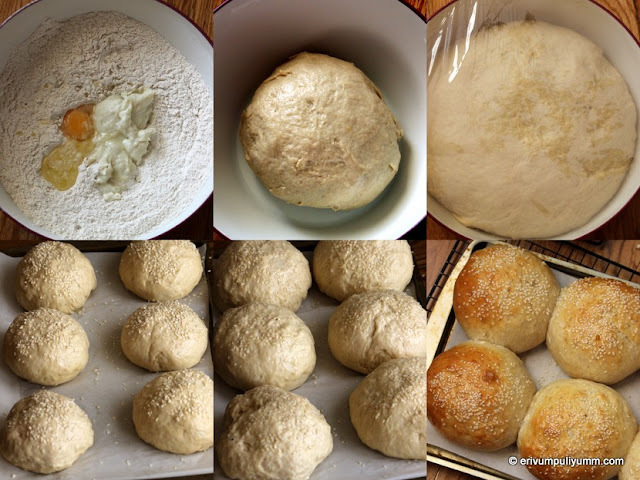 To test the dough, pull it until it forms sort of a thin membrane(refer pics here). This could take up to 20 minutes. 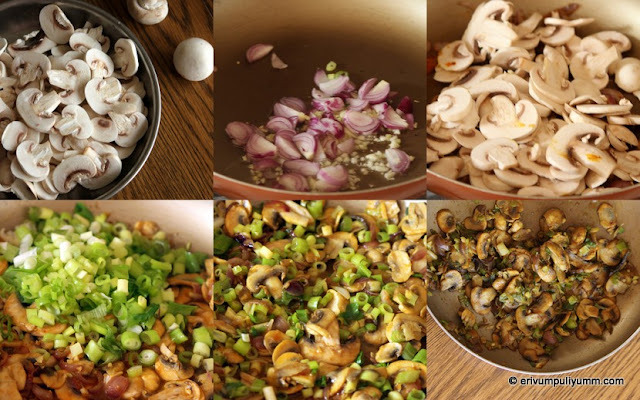 Place the dough into an oiled bowl or dough rising bucket, cover with plastic wrap, and let it rise until doubled. The first rise may take 40 minutes -1hour. Punch down the dough and divide in eight portions.Make tight balls of the dough by pulling the dough tightly around and pinching it at the bottom. Remove the rolls from the pan,brush the top with butter(helps to keep the crust soft and retains the color)and cool on a wire rack. Let it cool completely.Cut in slice and make your own burger.We had it with our own homemade black bean burger,check it out if you are interested !! 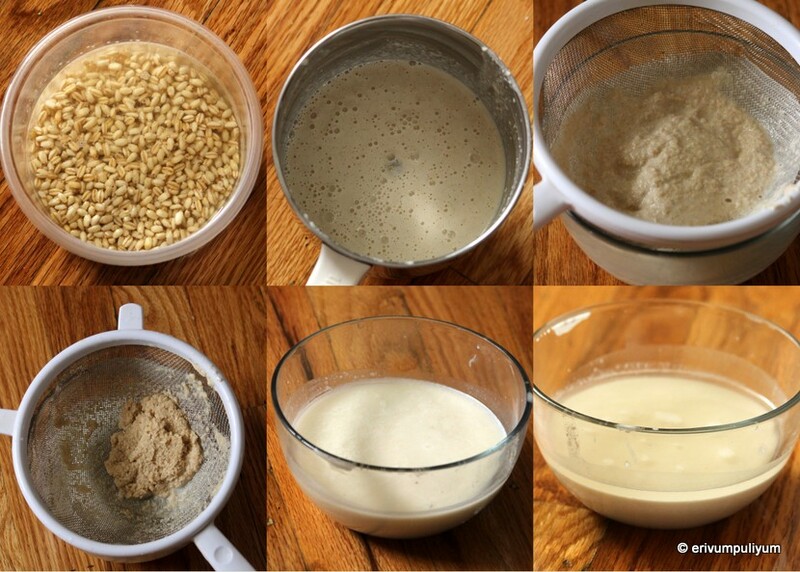 Mix flour in water well without any lumps. (I used milk) Cook over medium-low heat, stirring consistently with a wooden spoon, whisk or spatula to prevent burning and sticking while you cook along the way.The mixture becomes thicker and thicker. 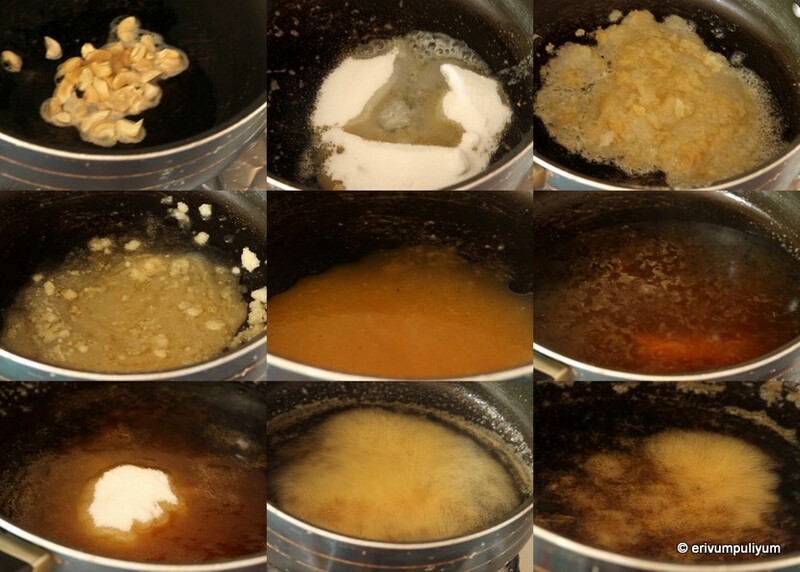 Once you notice some “lines” appear in the mixture for every stir you make with the spoon. It’s done. If you want to check the temperature of tangzhong it is 65 C/149 F.Remove from heat.Transfer into a clean bowl,cover with a cling wrap sticking onto the surface of tangzhong to prevent from drying up.Let cool.The tangzhong can be used straight away once it cools down to room temperature(see pics here).Just measure out the amount you need.The left over tangzhong can be stored in fridge upto a few days as long as it doesn't turn grey.If so,you need to discard and cook some more. (The chilled tangzhong should return to room temperature before adding into other ingredients.The whole tangzhong is used for making the above mentioned measure of buns. * If you don't have access to bread flour,then try to get vital wheat gluten and add a tsp to every cup of all purpose flour to substitute bread flour.OR try using all purpose flour alone in case you don't get vital wheat gluten but then you can't call it a wheat flour hamburger bun though. *The tangzhong method can be used to make the famous dilkush of our Indian bakeries or any other stuffed ones too.I had my own dilkush recipe in blog which stills runs to be one of the popular ones,so didn't give a try using this method.or try making your own whole wheat bread loaf using this method.If you are making bread,then this measurement will make two loaves. *The rolls should cooled completely before cutting slices otherwise it leaves a sticky texture.